Coppell, TX – November, 2018 – ENX Magazine and ENX The Week In Imaging announced that Datamax Inc. has been selected as a 2018 Elite Dealer. This annual Who’s Who of the office technology dealer community, which is published annually, will be featured in the December issue of ENX Magazine. The 130-strong 2018 Elite Dealers were selected based on numerous criteria, including growth initiatives, innovative marketing programs, outstanding customer service, charitable contributions to the community, progressive workplace cultures and adaptability to an ever-changing market. “We would like to congratulate our 2018 Elite Dealers, who continue to thrive and grow in a highly-competitive marketplace. Even as the needs of their clients continue to evolve, these dealers blend many 21st century tools and tactics with old-fashioned customer service—backed by a loyal workforce—to ensure successful outcomes,” said Susan Neimes, managing editor of ENX Magazine and ENX The Week In Imaging. "Once again we are proud to be honored for the third consecutive year as an Elite Dealer by ENX Magazine. The elements that influence Elite Dealer recognition are precisely found in the following tagline we live out every day: Relevant Technology. Raving Results.® At Datamax, whether you work in sales, service, administration, leasing, or our logistics department, the customer service bar is set the same and set very high. We aren't satisfied with a customer just being satisfied—we're only satisfied when we've created a raving fan," says Barry Simon, President, Datamax Inc.
ENX Magazine is a monthly publication dedicated to the document technology industry since 1994. Now in its 25th year, ENX Magazine continues to deliver exclusive editorial coverage on market opportunities and issues, news and trends, company profiles, new products, and industry insights through interviews with key players in all segments of the document technology industry. With a circulation of more than 28,000 hard copies, ENX Magazine is the leading integrated resource that brings together industry people, products, and business concepts and strategies for document technology industry professionals. The magazine also publishes ENX The Week In Imaging, a weekly e-newsletter that provides news, profiles, technology and business updates, along with blogs from some of the industry’s most prominent players. Datamax Inc. offers the latest equipment and solutions in technology to increase efficiency and productivity in customers’ offices. 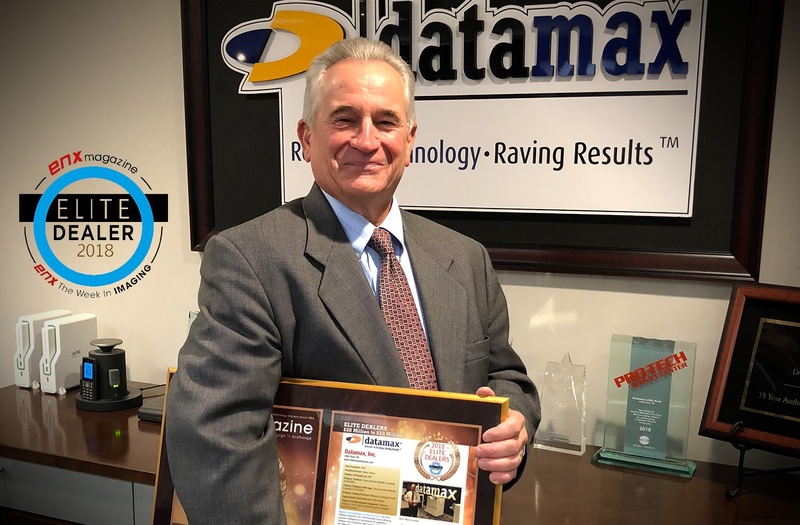 Datamax Inc. has been in business for over sixty (60) years with offices in Arkansas and Texas with more than two-hundred and seventy (270) employees in two (2) states. For the complete portfolio of Datamax products and solutions, please visit their websites at www.datamaxarkansas.com or www.datamaxtexas.com.